Ornamental pink flowering cherry trees offer showy blooms in early spring with the trees highlighted in cherry blossom festivals around the country. While each tree offers unique features, all offer gorgeous pink blossoms followed by beautiful green foliage that lasts all summer and into the fall. In late September, the leaves start to turn shades of yellow, red or orange, making the tree highly attractive in the fall, too. Several varieties of flowering cherry trees feature pink blossoms. The Okame cherry tree remains the star of the Cherry Blossom Festival in Washington, D.C., with clouds of pink blossoms. 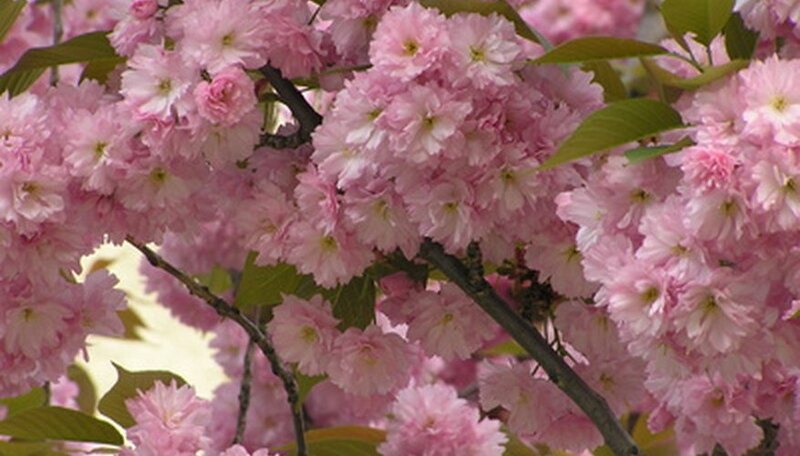 One of the showiest, the Kwanzan cherry tree features clusters of double pink flowers. The pink weeping cherry tree produces cascading branches of pink blooms that add form and beauty to any garden. One of the earliest ornamental flowering trees to bloom, Okame flowering cherry trees grow up to 30 feet in height in zones 6 to 9 The fluffy pink blossoms consist of one-inch petals, making the blossoms some of the largest of the flowering cherry trees. Both the Kwanzan and the weeping cherry trees grow in zones 5 to 9 with the Kwanzan growing up to 40 feet in height and sporting large clusters of 3 to 5 flowers that resemble carnations. The weeping cherry tree grows up to 30 feet high with drooping branches full of pale pink flowers in the spring. All flowering cherry trees, including pink-blossomed trees, require full sun or partial shade and well-drained soil. Weeping cherry trees require protection from the wind. The cherry trees grow in hardiness zones 5 to 9. When digging the hole to plant the tree from bare root, balled or burlapped stock, keep it two times wider than the root ball diameter and the exact height of the rootball. Once planted, water the new trees every two or three days for several weeks after planting. After that, continue watering the trees on a regular basis, providing extra water in hot or drought conditions. Adding several inches of mulch around the tree helps the roots retain moisture although the mulch should not touch the trunk of the tree. The trees also benefit from a program of slow-release fertilizer applied in the spring to promote growth during the growing season. While flowering cherry trees require little pruning except to remove dead wood, any pruning needs to occur in the summer. Weeping cherry may require a bit more pruning to keep the branches from dragging on the ground. The trees work great as the focal point of almost any garden. Planting a row of trees along a driveway or street adds beauty to these areas. Weeping cherry adds lots of color and form along ponds and waterways. The small fruits from the weeping cherry offer squirrels and other small mammals a food source. What Fruit Trees Grow in Northern Illinois?